U.S. President Donald Trump said during a visit to the State Department on Feb. 6 that he is confident troops fighting ISIS will be announcing the 100 percent defeat of the self-proclaimed caliphate within a week. 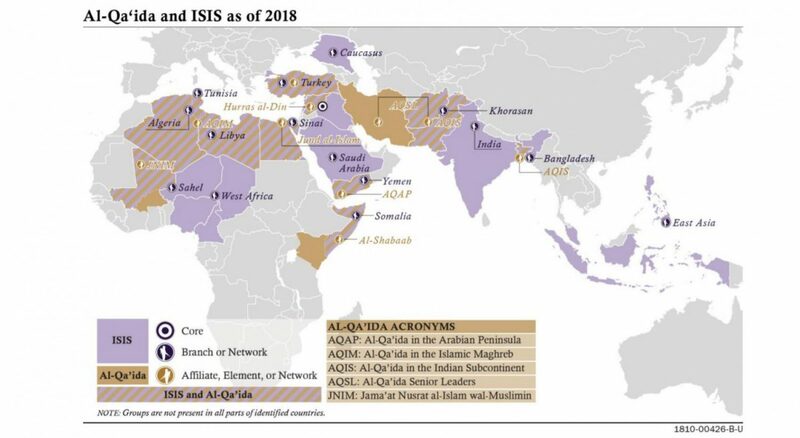 U.S. officials have said in recent weeks that ISIS has lost 99.5 percent of its territory and is holding on to less than 2 square miles in Syria, in the villages of the Middle Euphrates River Valley, where the bulk of the fighters are concentrated. 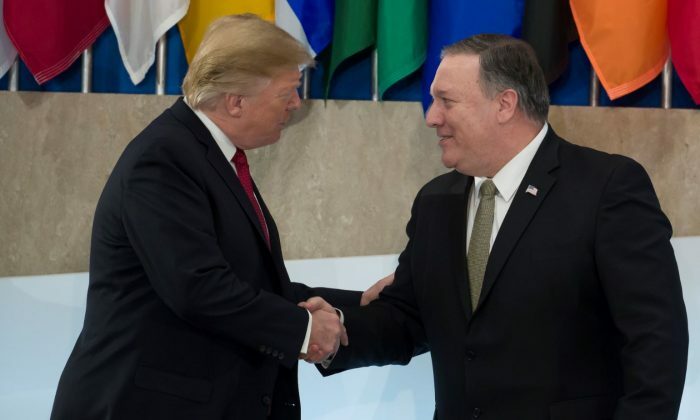 Trump praised the combined efforts of the United States military, coalition partners, and the Kurdish-led Syrian Democratic Forces who together have “eliminated more than 60-mile high-value ISIS leaders” and incurred ISIS other significant losses. “[T]ens of thousands of ISIS fighters are gone. They’re gone,” he said. “We’ve eliminated almost every one of them,” he told representatives from the 79-member coalition. “Their land is gone,” he said. “Rest assured, we will do what it takes to defeat every ounce and every last person within the ISIS madness, and defend our people from radical Islamic terrorism,” he continued. “We look forward to giving our brave warriors in Syria a warm welcome back home,” Trump said. Trump announced the troop withdrawal in December, citing the upcoming defeat of ISIS and that U.S. forces were no longer needed there. A Department of Defense spokesman confirmed on Jan. 11 that the coalition had started the withdrawal process. Defense officials have confirmed that some equipment has already has been moved out of Syria, and that plans for the withdrawing of troops are being formulated with the help of allies and partners on the ground. He said that the United States and its partners will continue to maintain pressure on ISIS cells in Syria and beyond. Trump sent a tweet that work toward the pullout would continue alongside operations to ensure the complete destruction of ISIS, saying that he did not want the Kurdish forces to provoke Turkey into war. The decision to withdraw the troops in Syria was met with some resistance. Jim Mattis resigned as defense secretary days after the announcement, citing a difference in views. Upon learning of the announcement, Trump thanked Mattis for his service and for his work “getting allies and other countries to pay their share of military obligations,” Trump wrote in his tweet. Patrick Shanahan is currently acting secretary of defense. White House officials have been insisting that the time has come for other nations to step up their contributions to the fight. “[Trump] doesn’t believe that the United States can solve this problem externally,” a senior administration official said when asked about delivering ISIS an enduring defeat. “He thinks it is something we can assist with, it’s something we can encourage, but that that has to come from within the Muslim community,” the official added. The official also said that the withdrawal from Syria would be “conditions-based,” with U.S. forces staying in the vicinity of the U.S. base at al-Tanf, in southern Syria, until the very end. And the president himself said Wednesday that even then, U.S. forces would stand ready to assist. “Rest assured, we will do what it takes to defeat every ounce and every last person within the ISIS madness,” Trump told ministers from coalition countries. The United States has spent $6 trillion on post-9/11 wars in the Middle East, according to the Watson Institute of International and Public Affairs (pdf). The White House and other top U.S. officials have also been working to reassure those concerned that the withdrawal will not impact U.S. allies, like the Kurds, or efforts to deal ISIS a lasting defeat. Secretary of State Mike Pompeo told coalition members earlier on Feb. 6 that while the “nature of the fight is changing,” U.S. goals remained the same. “It simply represents a new stage in an old fight,” Pompeo said in opening remarks at the conference. Epoch Times reporters Ivan Pentchoukov and Bowen Xiao, The Associated Press, and Voice of America contributed to this report.